The Garneau Tri Air Lite provides extreme comfort that lasts an IRONMAN distance. We took our best-selling Tri-400 shoe and gave it all the upgrades you could ever imagine. The exclusive dual X-Comfort technology delivers a snug, comfortable fit void of pressure points and eliminates collapse. With a wide opening, this silver-camo designed kick is a speed machine with Icefil, arch-supportive insoles. This revolution in tri shoes was design in cooperation with the professional athlete Lionel Sanders. The patented technology X-Comfort Zone allows shoes to fit two different foot widths, from C to D. This technology is available on select road and mountain bike cycling shoes. We've spent decades addressing power transfer and shoe weight, but the most common problem resulting in numbness and irritation is fit. Not only is shoe width a major problem, but foot volume expansion during any type of exercise has also been a neglected conversation, until now. The patent-pending technology expands to accommodate the rider's foot and foot expansion. 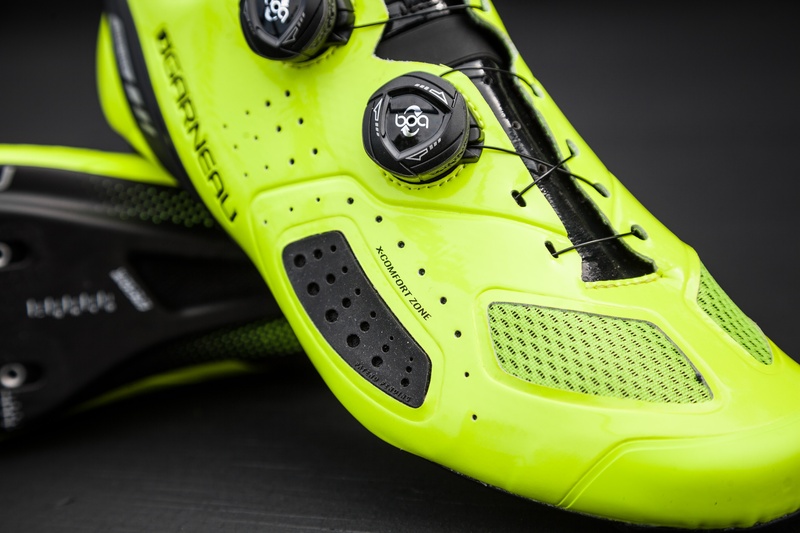 Step inside comfort with these three styles of road cycling shoes. The X-Comfort Zone creates a dynamic, non-constrictive fit for the foot’s natural toe splay, which improves power, reduces injuries, and creates unsurpassed comfort. The Course Air Lite, the reference in road cycling shoes, returns in 2018 in a stiffer version that adapts to all foot types. The new stiff Powerzone system covers the central part of the shoe, which wraps the foot to eliminate any movement when you are pulling on the pedals. So that the Course Air Lite also adapts to all types of foot arches, we’ve included the Transfo 3D insole that allows you to choose the level of arch support that best suits you. Weighing barely 7.8 oz (222 g) for a size 42 shoe, the Course Air Lite cycling shoe offers optimal comfort, spectacular performance and the highest ventilation for the least weight. Style and performance can go hand in hand, the Platinum shoes are proof of that. They offer a look that will appeal to the rider wanting to invest in a shoe offering great value for money. The Platinum is the most accessible of the shoes featuring the Boa® fastening system which allows you to adjust your shoe evenly with just a few turns of the dial. The Platinum inherits many recent technologies until now offered on our top of the line models. The offset opening of the shoe helps reduce pressure on top of the foot while the Powerzone system keeps your foot firmly in place to prevent it from moving when you are pulling on the pedals. Reach peak performance in the Ruby II cycling shoes – engineered to help you step it up a notch. The outsole features a patented ventilation system. The shoes tighten with a Boa® two-way micro adjustment system and hook and loop fastener foot closure. The offset opening of the shoe helps reduce pressure on top of the foot while the Powerzone system keeps your foot firmly in place to prevent it from moving when you are pulling on the pedals. The thermobonded upper is seamless for aerodynamic advantage and the elimination of pressure points, while the total weight of 278 g makes this an impressively light design for serious riders. The X-Comfort Zone is an expandable zone that stretches up to 5 mm to provide comfort and prevent numbness during long rides. In addition, the X-Comfort allows shoes to fit two different widths, from C to D, thanks to a ventilated elastomer-spandex insert. The X-Comfort Zone creates a dynamic, non-constrictive fit for the foot’s natural toe splay, which improves power, reduces injuries, and creates unsurpassed comfort. When cycling, feet swell due to the increase in blood flow to the muscles. Often cyclists' remedy has been to choose shoes a little larger for added room in the toe box. To avoid slippage, dials and straps were tightened causing pressure on the tendons and restricting natural foot movement during the pedal stroke. With the X-Comfort, the area fits snug to the rider's foot and adjusts as the foot widens during pedal stroke. Get ready to shred with these two styles of MTB shoes. The X-Comfort Zone technology offers the flexibility needed at the forefoot so that even the largest feet don’t feel cramped. The Granite II inherits many recent technologies until now offered on our top of the line models. The offset opening of the shoe helps reduce pressure on top of the foot while the Powerzone system keeps your foot firmly in place to prevent it from moving when you are pulling on the pedals. Furthermore, the X-Comfort Zone technology offers the flexibility needed at the forefoot so that even the largest feet don’t feel cramped. Built for the trails, the Granite II shoes have everything you need for a long summer day. The Ergo Grip 2 outsole features removable studs designed to maximize mud clearance and give great grip when you dismount. The upper is thermobonded for a seamless construction and minimal pressure points, while the single-dial Boa® closure system offers a fit that is quick to adjust at an extremely light weight. The inverted crampons of the Granite II outsole provide excellent traction on both uphill and downhill tracks. The Ergo Grip 2 soleplate is designed to maximize mud evacuation which will allow you to get back in the saddle quickly and without hassle.